College student Cesar Gonzales said he thought he “had a pretty good understanding of what it was going to take to have a career,” thanks to the Mopar Career Automotive Program (CAP). 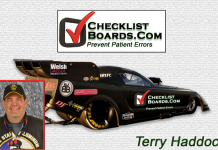 Then he attended Friday’s opening day of the Mopar Express Lane NHRA SpringNationals at Houston Raceway Park – and now he has an even better idea. Gonzales, 26, of Nacogdoches, Texas, was one of 27 students from Lone Star College Harris-North in Houston and San Jacinto College in the nearby suburb of Pasadena who helped launch Mopar’s and Pennzoil’s “Assemble Your Future” initiative. The students took the opportunity to absorb just what goes into getting Top Fuel contender Leah Pritchett and two-time Funny Car champion Matt Hagan ready to compete. They took a tour through the haulers at Don Schumacher Racing as guests – and perhaps potential employees one day. They, too, were learning Friday from local Chrysler / Dodge dealership service managers how they can put their automotive-technician classroom knowledge and skills to practical use. 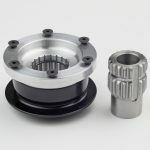 That is the core purpose of Mopar CAP, which Fiat Chrysler Automobiles (FCA) Performance Institute started in 1984: to prepare students to begin their automotive-technician careers upon graduation from a certified, two-year training institution (university, college, community college, or technical school). Today, more than 9,000 students are enrolled and have completed more than 100,000 class courses. For Tommy Hamilton, service manager at Mac Haik Dodge / Chrysler / Jeep Dealership in Houston, this program is a huge time-saver. 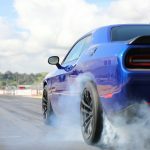 “This is a tremendous program for us, because we can take young inspired technicians that are learning the Chrysler product through Chrysler training and bring them into our dealership, work them half the day while they are in school, and work them full days when they are out of school. It gives us an opportunity to teach them how the dealership operations work, how FCA vehicles are worked on, the equipment. What is does is develops our future technicians to where we can groom and develop our own. That’s a huge plus,” Hamilton said. Hagan, who like Pritchett spoke with the students before making two qualifying passes, understands the value of Mopar CAP. 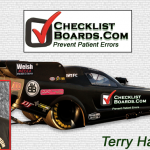 His family owns the Motor Mile Chrysler / Dodge / Jeep / Ram store at Christiansburg, Va., and operates a stand-alone Mopar Express Lane service center at Pulaski, Va.
Friday’s itinerary was the first activation of the cooperative effort with the NHRA. 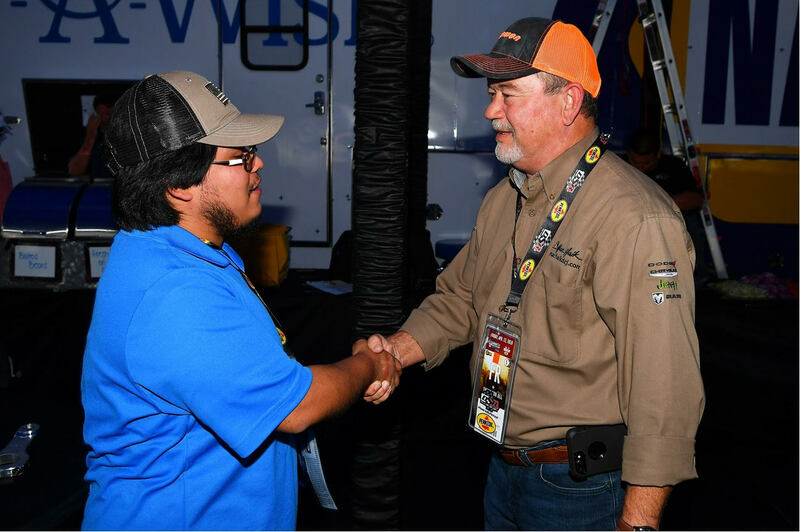 Mopar CAP student Jovan Mendiola (center) got some valuable information about career opportunities, as well as a close-up look at Don Schumacher Racing in action with new friends Matt Hagan and Leah Pritchett. Mike Lewis, vice-president at DSR, and Neal Strausbaugh, co-crew chief with Todd Okuhara for Leah Pritchett’s dragster, interacted with the students as they networked with dealer representatives, identified potential career opportunities, and met with Mopar and Dodge//SRT NHRA racers as a reward for their participation in the program. Houston-headquartered Pennzoil, title sponsor of Houston Raceway Park, supports this new initiative that reinforces classroom curriculum. 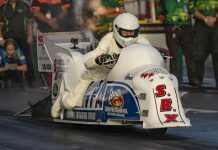 The students got a thrill from watching the crews service the cars behind the grandstands then fire up the 11,000-horsepower, nitromethane-burning Top Fuel dragsters and Funny Cars for two rounds of qualifying. “I’ve never experienced anything like this,” Gonzales said. That’s likely what dozens of his fellow Mopar CAP students will be saying as the year goes on. The “Assemble Your Future” campaign will visit three additional Dodge/Mopar-sponsored NHRA national events – in July at Denver, in September at Reading, Pa., and in October/November Las Vegas. Students from 12 Mopar CAP schools will have the chance to participate.